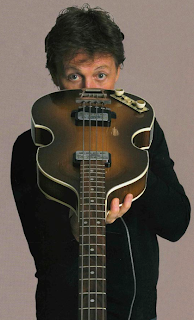 Paul McCartney first saw the German-made Hofner bass, nicknamed the "violin bass" for its body shape, in the Steinway shop in Hamburg during the Beatles' pre-fame days in 1961. It is likely that he asked the shop to order a left-handed version from Hofner. The Hofner 500/1 bass became McCartney's signature instrument. Soon it was unofficially known as the Hofner Beatle Bass. McCartney usually played his Hofner with the Treble Switch off and the Bass switch on and the Rhythm/Solo switch to Rhythm, according to the book "Beatles Gear" by Andy Babiuk.